Photoshop's Reset All Tools command has been around for a long time. In previous versions of Photoshop, choosing Reset All Tools would reset all of your tool settings in the Options Bar back to their defaults. This cleared away any previous, custom settings that were used. What Reset All Tools would not do, though, is reset the Toolbar itself back to its default layout. If you wanted to restore all of the default tools, you would need to go through each spot in the Toolbar one at a time and manually choose the default tool. 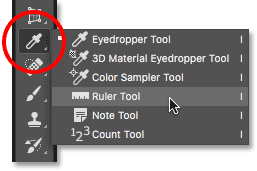 In Photoshop CC, we no longer need to do that. The Reset All Tools command still resets the tools back to their default settings in the Options Bar. But now, it also resets each spot in the Toolbar back to its default, primary tool. The improved Reset All Tools command was first added in Photoshop CC 2014. But because it didn't get a lot of attention, many Photoshop users are unaware of it. To use it, and to follow along with this tutorial, you'll need to be running Photoshop CC (Creative Cloud). You'll also want to make sure that your copy of Photoshop CC is up to date. This is lesson 3 of 10 in our Learning the Photoshop Interface series. Let's get started! In the previous tutorial in this series, we learned all about the Toolbar in Photoshop. The Toolbar is where Photoshop stores all of its various tools, from selection tools to editing tools, type tools, shape tools, navigation tools, and more. There are so many tools, in fact, that not all of them can be displayed in the Toolbar at once. Many of Photoshop's tools are hidden behind other tools. The Toolbar showing the Rectangular Marquee Tool by default. Use the fly-out menu to select any of the hidden tools. 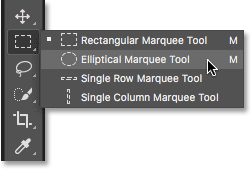 The Elliptical Marquee tool has replaced the Rectangular Marquee Tool as the visible tool in the group. By default, the Polygonal and Magnetic Lasso Tools are hiding behind the Lasso Tool. The Polygonal Lasso Tool has replaced the standard Lasso Tool in the Toolbar. Choosing the Magic Wand Tool from behind the Quick Selection Tool. Choosing the Perspective Crop Tool from behind the standard Crop Tool. Choosing the Ruler Tool from behind the Eyedropper Tool. The Toolbar showing several spots where the default tool has been replaced. Selecting the Move Tool at the top of the Toolbar. The Tool Presets option on the far left of the Options Bar. Choosing the "Reset All Tools" command. Clicking OK to restore the default tool and Toolbar settings. Each spot has been instantly reset to its default tool thanks to the improved Reset All Tools command. And there we have it! The improved Reset All Tools command is great, but it's not the only feature that Adobe has added to the Toolbar. As of CC 2015, Photoshop's Toolbar is now fully customizable, allowing us to finally create custom Toolbar layouts that better match the way we work! 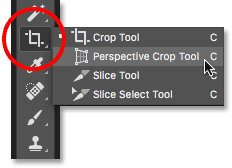 In the next lesson in this series, we'll learn how to customize the Toolbar in Photoshop!